So you want to use an environmentally-friendly paper in your print project, but with all the different certifications, what is the best option? What about FSC and PEFC, and shouldn’t you just use recycled paper? In this post, I’ve put together a summary of what’s available, the drawbacks and what your best options are. Like almost all manufacturing processes, making paper has impacts on the environment. Recycling paper saves on cutting down more trees and uses less energy than making paper from virgin pulp – overall this is thought to be between 40% and 64%. Internationally, about half of recycled paper comes from pre-consumer sources and a third from post-consumer. On average, paper can be recycled about five to seven times. Each time it’s recycled the fibres in the paper become shorter and eventually too weak to make paper. Because of this there will always be a need for virgin timber in paper production. However, we should use as much recycled paper as possible before cutting down more trees. 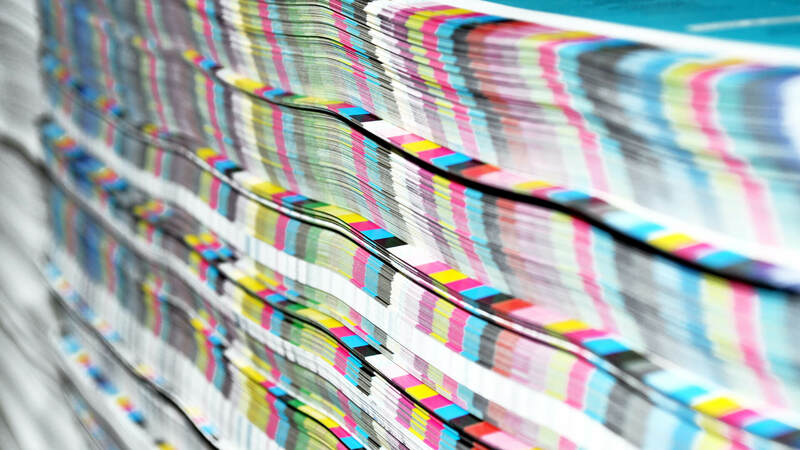 By specifying recycled paper on your print project you are helping to create demand for paper recycling. It’s best to aim for the highest level of post-consumer waste in your recycled paper choice. But how do you guarantee that the amount of recycled material your paper is labelled with is verified? The Forest Stewardship Council (FSC) and the Programme for the Endorsement of Forest Certification (PEFC) both certify paper as well as other wood products. Forest management – setting standards for, and certifying, environmentally and socially well-managed forests. Chain of custody certification – materials are checked at every stage of the process so you can be confident they are from genuine FSC or PEFC sources. 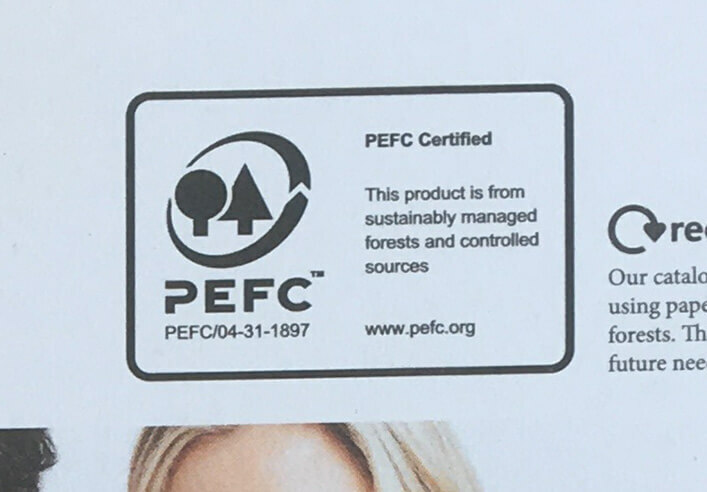 To display an FSC or PEFC label on your printed product, every business that handles the paper from forest to printer, must be FSC or PEFC certified. But why are there two certifications? It’s to do with the history of the organisations. FSC was formed in the early 1990s to address concerns with the illegal logging of hardwoods in tropical forests. However, as the idea of sustainable forestry certification grew globally, FSC’s system, which required every owner to be certified, was less suitable for boreal and temperate forests where large numbers of individuals own small areas of forests. The cost of certification would be prohibitive. Because of this, PEFC was started in the late 1990s with a group certification that made it more cost effective to certify small areas of forest. Since then both organisations have grown and developed, so FSC now have a group certification process for small forestry owners, and PEFC also deals with tropical and plantation forests. Let’s take a look at each and their certification options. Forests are inspected and certified according to FSC’s 10 Principles of Forest Stewardship. Verified by FSC as genuinely recycled paper. It can contain a mix of pre and post-consumer sourced materials. 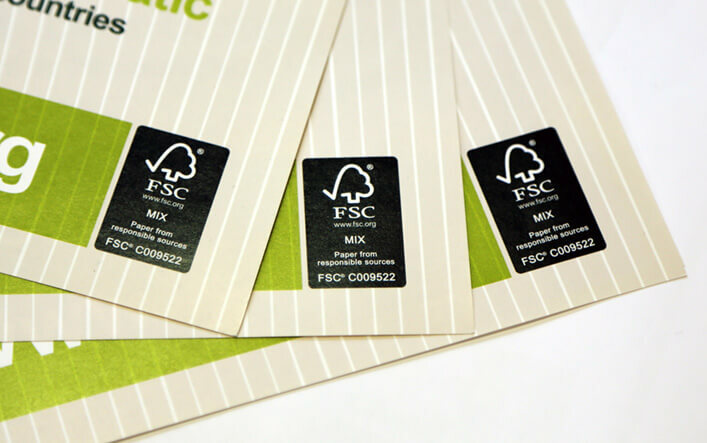 However, the FSC recycled logo doesn’t mean the wood originally came from an FSC forest. This means the paper is from FSC-certified material, recycled material, or controlled wood. PEFC has a ‘bottom-up’ approach to forestry certification, where national certification systems are developed independently and come together under the umbrella of PEFC. Standards are adapted to meet local cultural, socio-economic, physical, biological, climatic, and geopolitical realities while also meeting internationally-recognised benchmarks for sustainable forest management. PEFC forest certification has a set of requirements around biodiversity, ecosystem services, natural alternatives to chemicals, workers’ rights, local employment, indigenous peoples’ rights and legal frameworks. PEFC Certified means at least 70% of the material comes from PEFC-certified forests. The remainder can either be recycled material or from controlled sources. PEFC Recycled means at least 70% of the material used in the paper must be recycled. The remainder is from controlled sources. While the overarching principles for both FSC and PEFC controlled wood are similar, there are differences in the details of the requirements and the assurance systems. Problems with FSC and PEFC? This doesn’t mean Greenpeace is now a supporter of PEFC, which it still sees as weaker than FSC. Their view is that when virgin wood or fibre is absolutely necessary, FSC 100% remains the best available option. If you are a large volume buyer of paper, FSC should be seen as a useful tool, but further due diligence is often required on where your paper is sourced from. For the eco-friendliest option, always consider first how you can reduce the amount of paper required. My recommendation would then be to use FSC Recycled with a high post-consumer waste content, ideally 100%. If that is not possible, then FSC 100% would be the next best option.